The Zerona medical laser machine provides highly effective body sculpting to remove fat and gently contour the body without the need for invasive surgery or other cosmetic treatments. By utilizing the powerful Erchonia Laser Scanner, the Zerona emulsifies fatty tissues which are then released into the body. Through this perfectly harmless process, the remaining fat cells are naturally eliminated by the body after a few days, resulting in a noticeable difference in size. Over time, patients who receive treatment with the Zerona report an average loss of 3-4 inches without any painful side effects to deal with. Unlike other methods of surgical fat removal and traditional liposuction treatments, there aren’t any needles, bandages, or bed rest required after treatment with the Zerona. The Zerona laser system makes it easy to add body contouring treatments to any cosmetic practice. The treatments are fast and easy to perform, allowing your practice to see even more patients throughout the day. It’s the perfect solution for a growing practice that’s ready to offer more services and get new patients in the door. When you’re ready to dive into the growing world of body contouring, the Zerona laser machine system is a smart choice. It’s easy to operate, delivers fast results and utilizes the latest in fat reduction technology to produce incredible results. 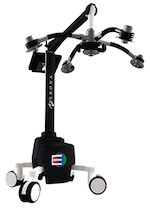 Interested in adding the Zerona laser system to your practice? The Zerona is the perfect addition to any busy cosmetic practice that wants to expand its service offerings to include the most in-demand services. SunrayLaser.com has amazing deals on used Zerona laser equipment with savings that are up to 60% off the original price! See for yourself how much you can save on high quality used laser equipment when you buy from SunrayLaser.com. Looking for pricing information and other details about our selection of preowned Zerona equipment? Please fill out the form below and we’ll provide a fast and free, no obligation quote. It’s an easy and no-risk way to learn more about this outstanding line of cosmetic lasers.